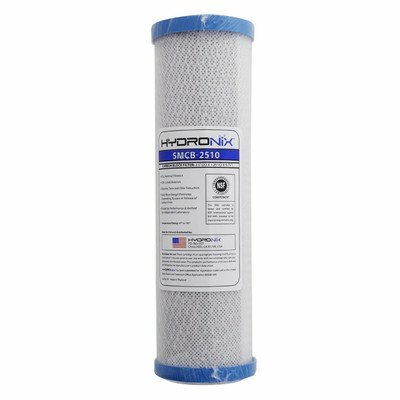 HYDRONIX-SMCB-2510 Features: -Carbon block filter for a water filtration system. -Coconut shell carbon filter media with polypropylene outer/inner wrap, end caps and netting. -Particle retention size of 0.5 micron. -Meets ANSI/NSF Standard 42 certification for material requirements only. Product Type: -Whole house. Filter Component: -Replacement filter. Dimensions: Overall Height - Top to Bottom: -9.88". Overall Width - Side to Side: -2.75". Overall Depth - Front to Back: -2.75". Overall Product Weight: -0.89 lbs. Specifications: NSF Certified: -Yes.